Kelly Richardson, Exiles of the Shattered Star, 2006, HD video installation with audio, 29 minutes 51 seconds. "Legion" is attitudinally split between room-size, seemingly earnest video installations and smaller, witty videos. This division might lead one to believe that Kelly Richardson loses her appreciation for humor and comic absurdity when working in large, multichannel formats: The relatively small and simple Ferman Drive, 2003-2005, by contrast shows a long tracking shot of suburban banality interrupted by a punch line-a house (the artist's childhood home) spins like a top. Her descriptively titled A car stopped at a stop sign in the middle of nowhere, in front of a landscape, 2001, shows similar flippant absurdity. Richardson adds action in the form of drifting clouds and flying birds, but indefinitely suspends narrative. Richardson's larger and mostly later works similarly resist diegesis, but for these, biblical and dystopic interpretations abound. Indeed, this exhibition's wall, Web, and catalogue texts teem with messages about bleak science-fiction settings and end-of-world scenarios. However, Richardson seems to play with, rather than into, millenarianist anxieties. 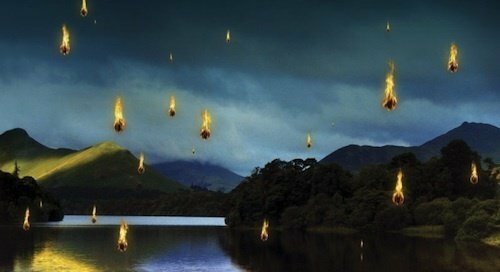 For instance, with her overly phony, gently descending fireballs set against a picturesque lakeside, Exiles of the Shattered Star, 2006, seems more Chicken Little than Book of Revelations. In both Mariner 9, 2012, and Leviathan, 2011, ominous bass sound tracks are overstated signifiers of doom in the face of marvelous, pixel-driven spectacles, respectively of a Martian landscape littered with quirky, animated space junk, and of outsize will-o'-the-wisps making a dank swamp resplendent. Given the artifice, the ponderous and panoramic seem to work against the profound. An earlier piece with similarly seductive, if understated, mediations, There's a Lot There, 2001, shows mosquitoes alighting on a screen door, through which we can see a pretty sunset. Gorgeous moiré patterns announce her video vehicle, while piercing, electronic mosquito sounds turn the innocuous into the ominous. This particular video, along with her droll low-key works, suggest an impishness underlying Richardson's face-value gravitas.